An avatar of Canadian astronaut Chris Hadfield hangs out in Degroots Nurseries, a few feet from where Hadfield himself was doing a book signing on Nov, 23, 2013. SARNIA, Ontario — Mustaches were everywhere. On the balloons, face-painted on children and of course, on the face of celebrity astronaut Chris Hadfield himself when he showed up at the book signing. In this town of 72,000, an estimated 1,000 people lined up — the first at 3 a.m. local time — to watch the former commander of the International Space Station visit his hometown in western Ontario on Nov. 23. 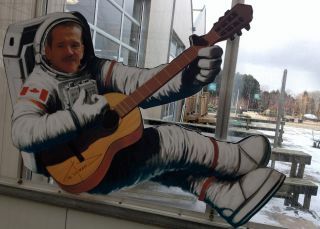 Hadfield is currently on a multi-country book tour to promote his first book, "An Astronaut's Guide to Life on Earth" (Little, Brown and Co., 2013). Canadian astronaut Chris Hadfield chats with a young fan at an event in Sarnia, Ont., Nov. 23, 2013. Bieke remained in her car, however, until Sarnia-area resident Cindy Simmons arrived with an armful of books around 6 a.m. to start the line. "I had a stool, and moved one of the signs to make it the beginning of the line," Simmons told SPACE.com. Hadfield's event was more than an opportunity to sign books, however. His space pictures served as inspiration for a local artist, who then turned her interest into a charity event. The astronaut's first steps inside the crowded room took place next to Cat Cabajar, who helms a local business called The Painted Cat. Several months ago, Cabajar received a $1,000 grant from a local organization to take Hadfield's pictures from orbit and put models in front of them, painted in the same colors as the picture. After months of preparation, Cabajar had a precious few moments with the busy astronaut to show the results. Sarnia, Ont. body paint artist Cat Cabajar poses with one of her pieces, inspired by pictures taken by Canadian astronaut Chris Hadfield during his 2012-13 space mission. Each shoot took four hours, and there were challenges along the way. One image was lost forever after a computer crash. Cabajar struggled with the tracing at times because she is a freehand artist, she said. These challenges were forgotten on the day of the event, however: "I can't wait to see his reaction," Cabajar told SPACE.com less than an hour before Hadfield's arrival. It was a unique time for Cabajar, who unusually found herself working closely with fellow Sarnia businesses Degroot's (which hosted the event) and The Book Keeper, which provided the books for the signing. To give back to the community, the three businesses also hosted a benefit concert later that day to help the Inn of the Good Shepherd, a local organization for struggling families that recently lost $180,000 in annual provincial funding, she said. Lily Johnson, 7, wearing facepaint inspired by Canadian astronaut Chris Hadfield at a book signing Nov. 23, 2013. At right is a balloon with Hadfield's face. Hadfield was well-known within his own country due to his previous visits to space in 1995 and 2001, when he respectively became the first Canadian to visit the Mir space station and first Canadian to perform a spacewalk. Hadfield's popularity exploded worldwide in early 2013, however, as he prepared to command the ISS – another Canadian first. His social media videos and pictures – along with his guitar playing – attracted millions of views and attention from many celebrities, including Star Trek stars. Although Hadfield is retired from space now, he still appears at Canadian Space Agency events. He recently promoted a new space-themed $5 bill appearing in circulation in Canada in November, for example. The recently retired astronaut also accepted a teaching position at the University of Waterloo for aviation and other departments, which is expected to start in 2014.